The Gates Of Hell is heavily rooted in the original heaviness and brutality of the NY/NJ Death Metal. The band, however, finds its own ways how to execute the genre. "The Gates Of Hell" mercilessly blasts and slams the listener back to a time when Death Metal records had personality, when Death Metal dwelled in the underground and was sounding hostile and disturbing to the unprepared ears. Death Metal wasn't for everyone, it needed effort and time to get into it. This is the message and attitude that still prevail with "The Gates Of Hell". Fans of Suffocation, Morhpheus Descends, Skeleton Of God, Entorturement get ready to be thrown into a grinding and twisting whirlwind. 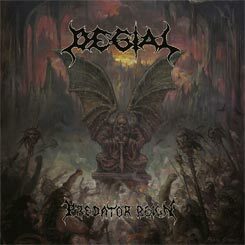 Songwriting resulting in tormenting and thrashing NYDM heaviness, severe rhythmics, impressive soloing and ungodly atmospheric parts, which echo the hellish vibe of classic American death metal albums, shall be expected. Once again, in the authentic, Day Of Doom delivery. The cover art was conceived by the mighty Raul Gonzales. Design by ArtWars Mediadesign. 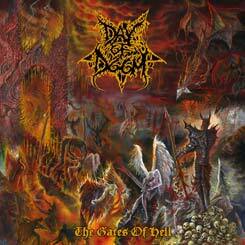 Enjoyable, interesting and atypical; Day of Doom are worth taking seriously.